Wow ... nice looking room! still not much to show, but at least this time it is a train. 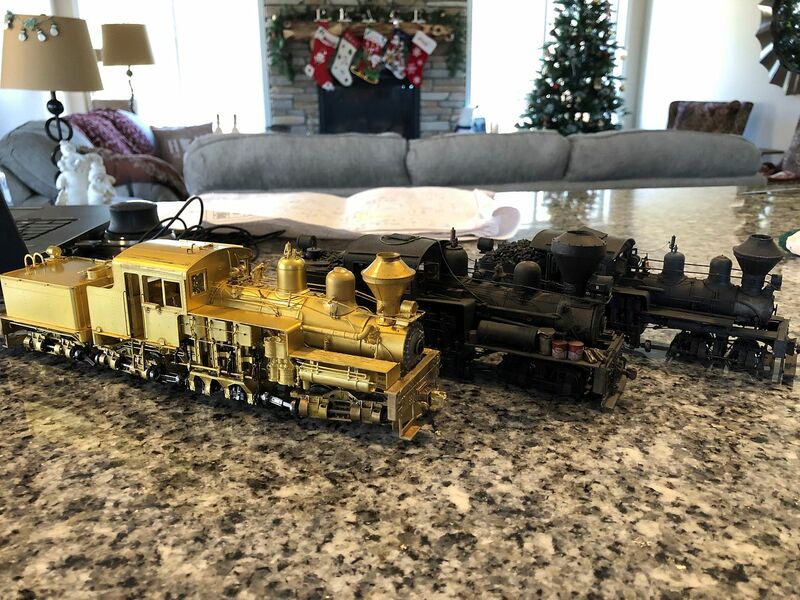 I purchased a locomotive from Ebay that was one of Lee Snover's locomotives. Lee was a pretty well known model railroader in some circles of the hobby, and sadly he passed away a few months ago. I was talking with Lee when I was working on the repowering of my Westside Heisler. Lee was known for many things, one of which was his ability to get Precision Scale shays to run really well. I was poking around Ebay and notices that some of his personal shays were being listed, one of which is was a large 60 ton Oregon Lumber shay #7. I tried to ignore it but it did not work and I ended up winning the auction. The Slater creek now has a BIG shay. I will do a few modifications to get it to fit the family and then paint in in the next year. And in case you were thinking, a west cost shay in WV, this shay looks like a west cost shay but it is not, it is much smaller than a WCS, but what a beef cake! And although it is a stretch to see it in WV it could have been. it was even built as a coal burner before being converted to a wood burner. I assume by the stack that this model is a coal burner. here is the shay with my other two three cylinder shays. as you can see it is much longer than my previous big shay (#8) bit really not much taller. for the record #8 is getting a new boiler and dome placement in the next year or 2 and it will make it look a little bigger. sorry for the poor photo, I still have no good model railroad space. The high sill/running boards are the first difference that caught my eye between the new and old Shays. Did Lee run this locomotive? Is that front coupler operable? I just bought a book on the Yosemite Valley RR and it included all the logging inclines along the line. They hoisted those large 3 truck shay up a 78% grade! that high running board is also the first thing that I saw as well, I like it. if you look at my Babcock number 2 shay it has a raised running board and an air tank mounted below as well, just not as raised, so there is a similar look. the other thing that caught my eye is the snow plow mounted to the front and rear truck, not sure if I will keep those on yet. I don't know if Lee ran this on layout of his own, I am assuming he ran it on a test track. I have not applied any power to it yet because I still do not have a work bench set up. I don't even know if this is DC or DCC yet. it do know that the drive is smoooooooth. with the drive shafts disconnected it rolls like butter. I turned the crank shaft by hand and it is also smooth, and I can feel the coreless motor. my only concern is how powerful will it be. My #8 shay is a beast of a powerhouse, but it has a second gear reduction at the rear truck from the Grandt line gear set, this new shay seems to have a sprocket on the motor and is direct drive. Also, my #8 shay really out weighs this shay and it has steel driving wheels which give it a lot of traction. I will want this big shay to at least equal my #8 so I am hoping I can make it all work out. I am tossing around ideas on how I might change some of the details. for sure the stack is going to change, I want to make one of those flat top spark arrestors for it. The only other things I am considering so far is bigger lights, and maybe doing the real wood running boards. I am so impressed with the real wood on my Babcock #2 shay that I may do it on this shay and on my #8 when I do the new boiler. The coupler is a non operating brass casting. I will be replacing it with either a Sergent or a Kadee (if I go back to Kadee). I am making progress on the work shop, I have the walls framed and I am in the process of wiring the outlets and the lights. there is a lot of work left to do with the ceiling. I need to round and air return duct and at the moment there is no room so I am going to have to get creative and figure something out, then I will be able to install a drop ceiling. I wanted to do a drop ceiling so I still have access to the utilities. it has been almost one year since I moved into our new house, and although I did build the train room I am not able to use it yet. that last few weeks I have been building a new work shop. I am almost finished with the shop, enough so that I was finally able to clean off the saved section of the original layout and vacuum it. the section suffered a lot of damage to the trees which is not the end of the world because since I made those trees I have come up with a way to do them that I like better and now I will redo the trees on this section to the new way. 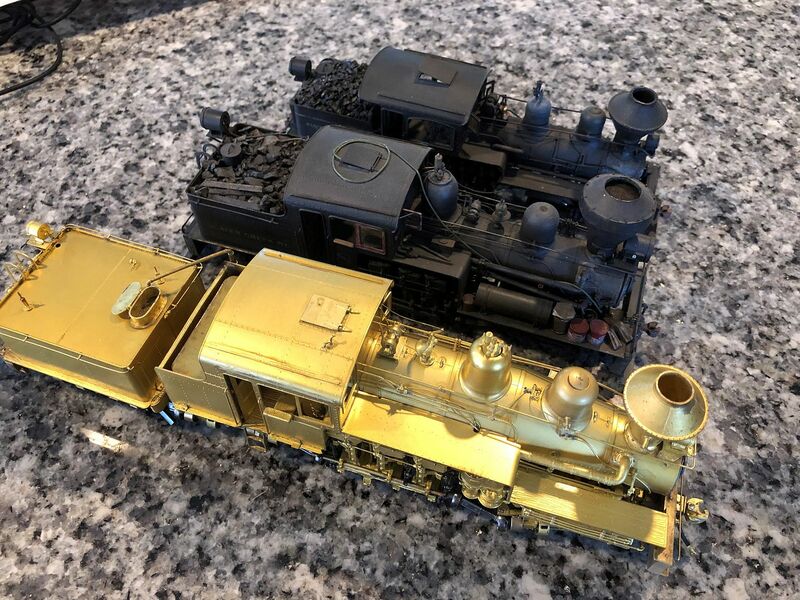 I did take a couple coal cars out of their boxes to see how they compare with the new shay. I feared that the new shay would look way too big but after seeing them together I think it is just right, and I really like it. I like the look of the new shay so much that I don't think I am going to alter the details on it at all. When I first got it I was going to change the stack and head light but I like it just as it is. I am going to get it in paint after I install a decoder in it. I was able to run it in DC and boy does it run smoooooooth, very happy with it, Mr. Snover really did a great job reworking the drive on this one. That shay looks great Jeff! Care to explain the new process? The shay looks wonderful in that scene. Very muscular look. How is your new shop working out? that's some beautiful brass you have there. Congratulations. the shop is coming along good, at the part of it that I am building is. since the one section of the layout is sitting in the shop I can't finish that side until the layout section is moved out. I have two walls finished and a bench up, hopefully today I will get some drawers set up. I also am going through boxes of HO stuff, trying to get it ready to sell. one good thing about not being able to build a layout at the moment is that I can really spend some time creating a nice work space. 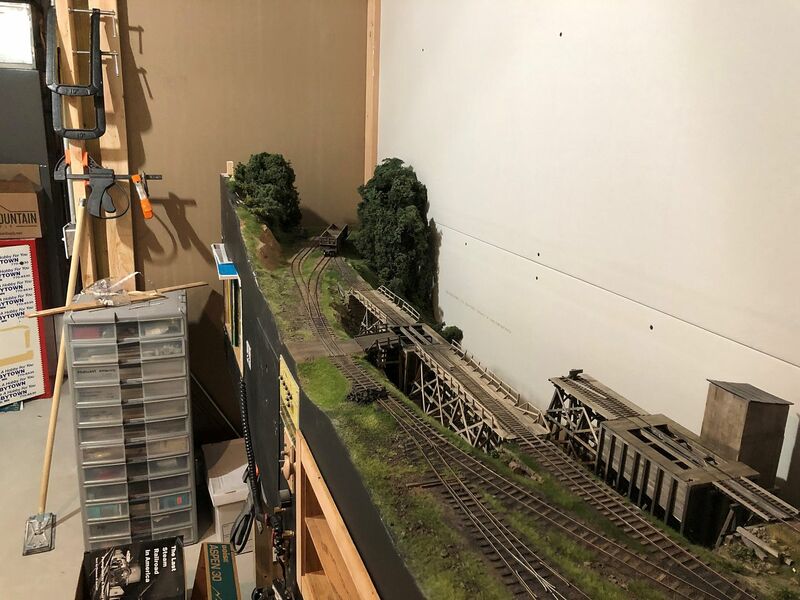 I am thinking of getting a new backdrop from trackside scenery to put up behind the layout section so it looks better than the unpainted drywall. almost there! I am getting closer and closer to be able to build something train related. I finished my new work bench and started unpacking stuff. 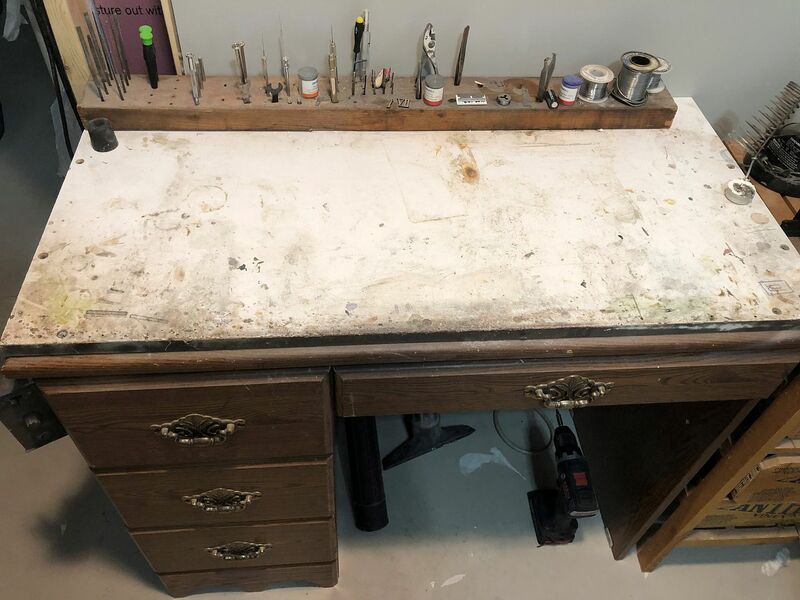 for now I am keeping my original work bench and I will use it for metal working, the new bench will be more of an assembly, painting, and weathering area. Basically a nice clean space and a place to bash and crash. once the layout is out and I finish the other two walls I will build a new "bash and crash" bench, one which I hope to some day have some nice power tools set up on. my original shop goal was to just build the two walls that the work bench would be on and leave it at that, however I have decided to build a wall between my shop and my furnace. I picked up a pocket door frame and this week I will start on that wall. I have to extend the return duct to the furnace and then I will install a drop ceiling in the entire shop with lots of lights. I also plan on painting the floor. here is the shop so far. in the photo above you can see the layout section on the left. the wall with the old bench on it temporally ends so the layout can extend into the future closet. 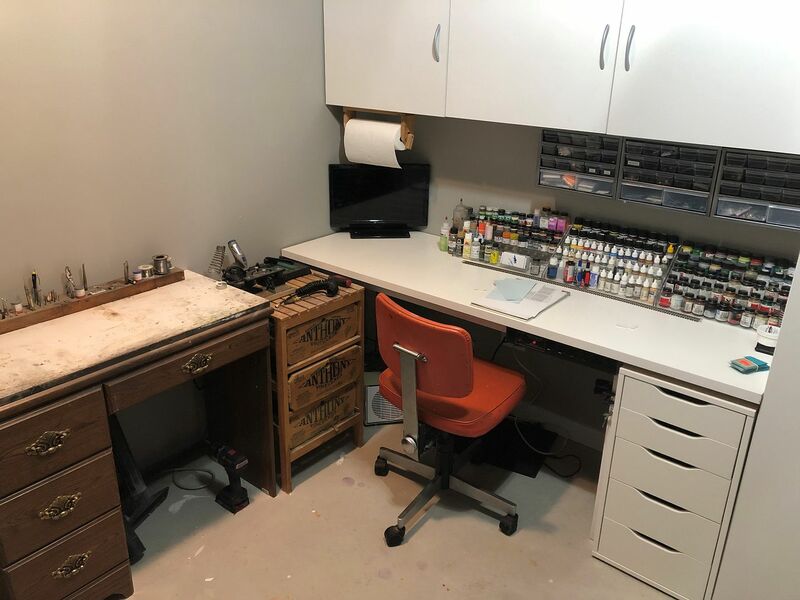 once the layout section is moved out I will build the wall across the end of that and build another bench down that wall. here is the old bench. its hard to believe that I have been build on this tiny bench for the last 20 years, and that's all I had. here you can see the layout in its temporary space. when I build the layout room I left one stud out of the wall so once my son moves out I can just cut out the drywall and move the layout section into the next room, then replace the cut out piece, add the missing stud, mud and paint it. none of the walls in the basement are supporting walls. all last week I have been sorting through a life time of HO scale stuff from all my previous layouts to get it ready to sell. 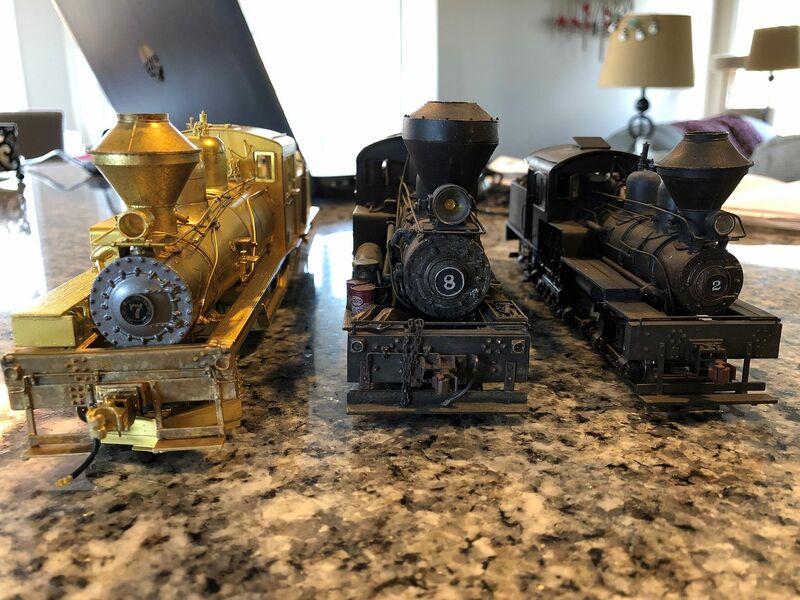 By the way, some of that stuff I will be posting in the selling section on this site, most is HO from my Roanoke and Southern layout but some is On30 stuff that I bought when I was going to build in that scale/gauge and now I won't use. Anyways, while going through all that stuff I decided that I did not want to get too carried away on the new layout. I have been reviewing my latest layout plan, along with doing some mock ups, and I decided that I don't want to build that big multi deck layout. I came to the conclusion that I am really just a single deck layout guy. I like a layout that is about chest level, which was the average height of my original Slater Creek layout. if I build a double deck layout both decks will always be not exactly correct. I went back through this post and looked at the plan I did when I was thinking of adding a room on to my previous house. I really liked that plan, which was basically what I was doing with the exception of adding the standard gauge interchange, extending the run, eliminating the switch back, and unstacking the scenes. I decided to see if I could put that plan in my new room. here is what I am thinking about now. it is basically a long run up to the strip coal tipple, which this time is at the end of the line (tip from Mark Chase). I did include the Manns Creek car shop (full scale) and company store (slightly scaled down) but I am not sure I am going to keep them in the plan yet. I am almost sure I am going to build a smaller company store and have the siding outside, that MC store is just a giant in model form. unfortunately the strip tipple is mirrored, however I may actually only use the tipple for inspiration and create something my own, mostly due to lack of good photos of the tipple's gate system and my desire to make it operate. I did need to have one short section of double decking to include the standard gauge interchange. this idea I got from my Manns Creek layout, which worked very well. basically it is just a shallow section of the layout with a very simple track arrangement. it is more of a visible fiddle yard than it is an operating area. I will scenic it because it is visible but it will all be very minimal. only one train a day will travel down there so I don't mind that it is a low and shallow deck. it will need to be reached by a drop gate but my old drop gates worked very well and this gate is not a main track so most time it will be lowered. one idea I am toying with is what to do with all the space on the inside of the layout. my original thought was to put up a backdrop and isolate this space, then reach it by either a nod under or a narrow walling space. this center of this space will still be on a raised platform to set the layout operating height at about chest level again. after drawing the plan I could not figure out a way to get through the backdrop without a awkward hole in the sky or the use of a tunnel. I decided to try and leave the backdrop out for most of the area and just have a wide layout that is operated from both sides. the advantage is that scenery can be used as the view block and I an not constrained by straight edge of a back drop. I think with some high ridges and trees I can pull it off, but to test this idea I am constructing a scale model of the layout that I will be able to use some clay on and test the scenery. inside the "blob" I decided to design a branch line to serve another larger coal mine. I will have to reduce my track standards a little to get it to work out (steep grades and sharper turnouts and curves). the branch is reached by a steep switch back. once the operator is up the switch back they can walk around the end of the layout and enter the center of the layout. at this point the branch will almost operate like a separate railroad. there is a large mine and a second coal dock for truck unloading. I also have a siding that just goes to a dirt ramp for loading and unloading of equipment and supplies. there is a small company store as well. a hidden track at the switch back will be used to store a train from a nearby sawmill. once a day this train will deliver cars to be brought down to the interchange and pick up empties to return with. I always wanted a small single stall engine house so I included it here as well with the goal of having my Climax stored here to be used on this branch. this plan is still in the "thinking about it" phase. I like how simple it is. there is not much scenery trickery to pull of except for the exiting staging track and if I can pull of the use of scenery to separate the operators. its hard to show on the plan by I want to use a lot of vertical scenery in those areas, the layout is 5 feet wide there and I think I have the space to do it. operating looks simple but I have learned you don't need that much to have a lot to do, shays move slow and switching takes a while. I have to remind myself that I am trying to recreate the look of a simple backwoods mining railroad and if I over track the layout it won't look right. here is the simple plan. the heavy dashed line shows where a possible backdrop will be if I can't get the scenery to do what I want. 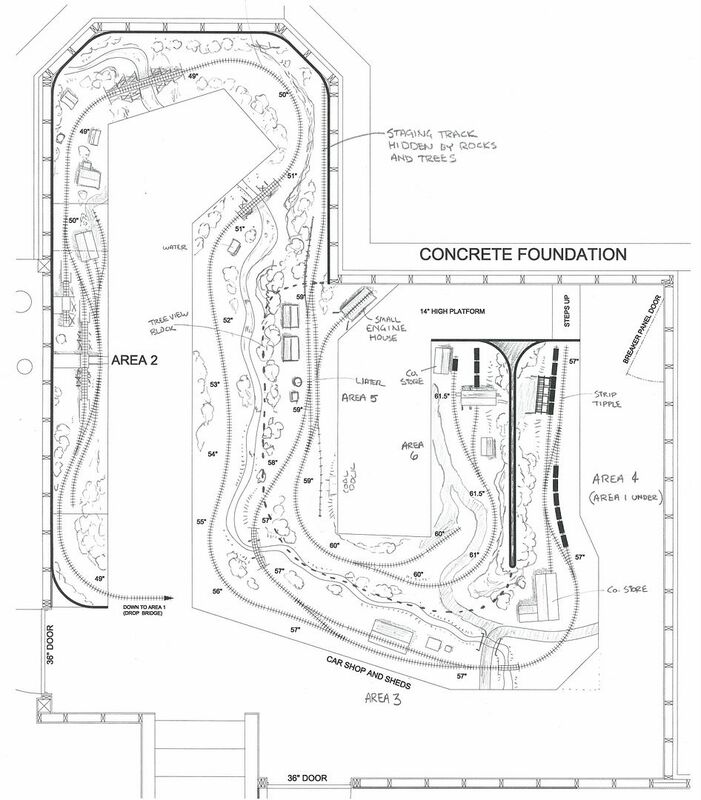 Very Nice track plan. I like your reasoning too too. As much as all want a long run it needs to have enjoyable viewing. Your shop is looking good. There was a good article about shop space for modeling by Jack Burgess in the Feb 2013 MRH. 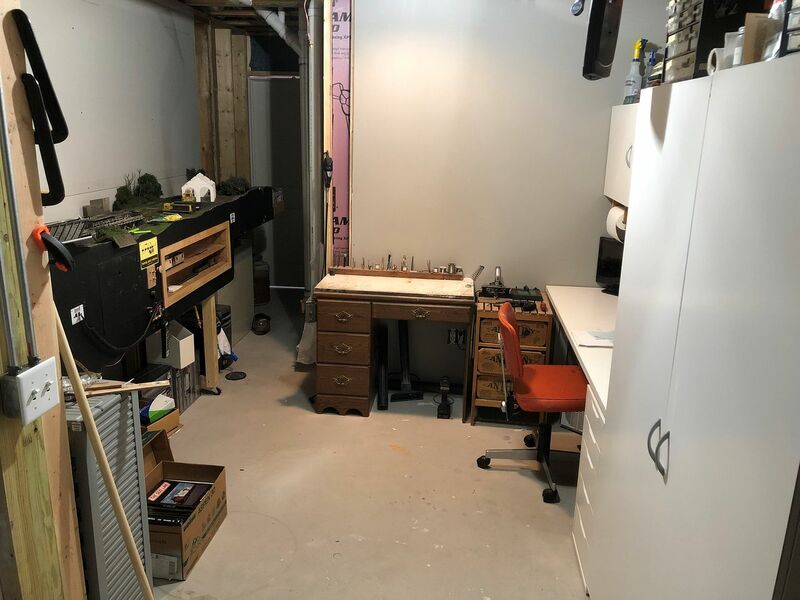 I have some work surfaces in my shop that are bench height which I have found to be good for working on larger models like O scale structures. Having the option to stand up and work is something I do pretty often. I like the simplified track plan. I see you have a long stretch where the main line is following a creek that is on the other side of the track from the aisle ... and you are considering a high scenery viewblock in almost the same space as the creek. It will be interesting to see how that works out on your mockup. Very Nice! Huge task at hand!